Project obstacles and solutions: In preparation for the construction of U.S. 141 Hartsville Pike Highway, a section of new gas pipelines needed to be laid near Hartsville, Tennessee. Pilgrim Construction was contracted to do the pipeline work. Pilgrim cut an access road to some of the more remote sites where they would be working. IMI was contacted to produce and deliver 1,500 yards of imix Flexifill, a flowable backfill product that is commonly used with utility pipes. The topography to the site proved challenging for safety and on time delivery. At one point, the access road had a 60 degree grade that descended to the site. The decline was so severe that there were safety concerns about the mixer trucks getting to the site without tipping. There was also a concern about losing the flowable product out of the drums while the trucks were moving down the hill. IMI places the highest priority on safety at the work site. A fully loaded mixer truck can weigh in excess of 70,000 lbs. IMI drivers and safety personnel met with Pilgrim and surveyed the construction site. 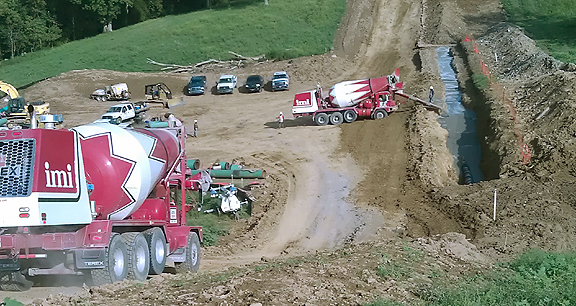 It was determined that the mixer trucks could travel safely down the hill with 7 yards of imix Flexifill. To prevent spillage while navigating the hill, trucks turned their drums at full speed, holding the product in place with the centrifugal force of the spinning motion. The next challenge was the tight time restrictions Pilgrim had for completion of the pipeline. They needed delivery of the product to happen in three separate pours, each being 500 yards of continuously poured flowable fill. With the trucks carrying 30% less than a full load due to the safety restrictions, the dispatching of trucks was critical. The Lebanon, Tennessee plant supplied the project. At its remotest location, the job site was a 40 minute drive from the plant. The dispatch team worked closely with IMI technical services, drivers, plant manager and sales reps to make sure that the product was delivered on time and was setting properly. Each of the three pours on the pipeline site required 72 continuous deliveries to complete. IMI was able to commit their mixer truck fleet to this project and had the expertise to meet both quality and time demands. For more information on imix Flexifill, click here.